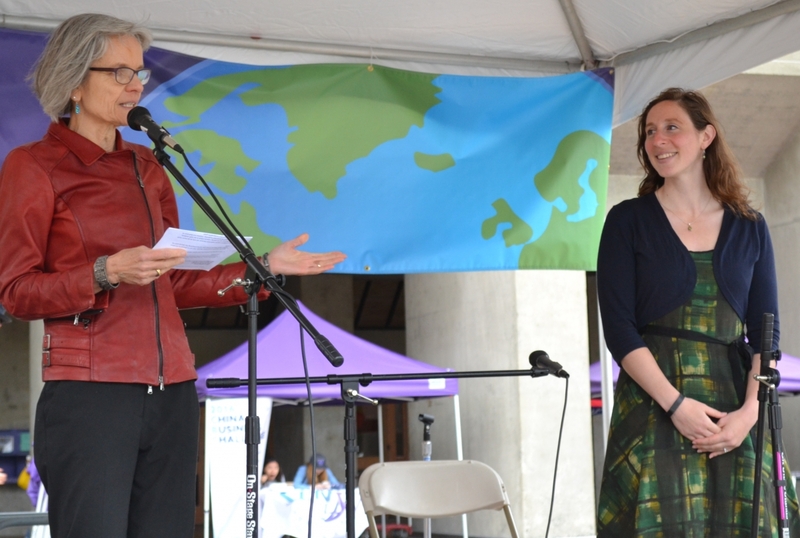 The Husky Green Awards celebrated their seventh year of recognizing sustainability leadership at the University of Washington, with an award ceremony during the 2016 Earth Day celebration in Red Square. 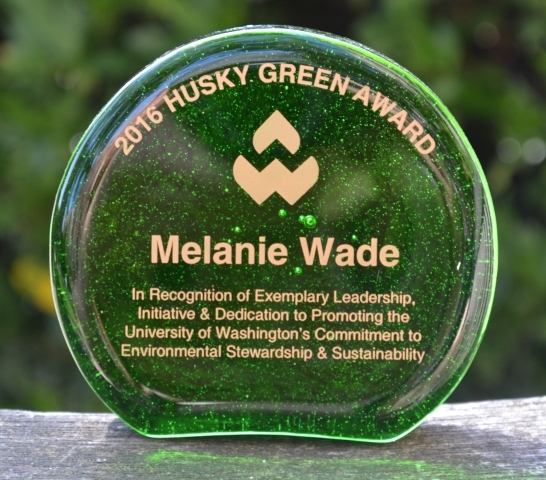 Dr. Lisa Graumlich, Dean of the College of the Environment, and Student Regent Vanessa Kritzer presented the awards to the seven 2016 Husky Green Award winners. 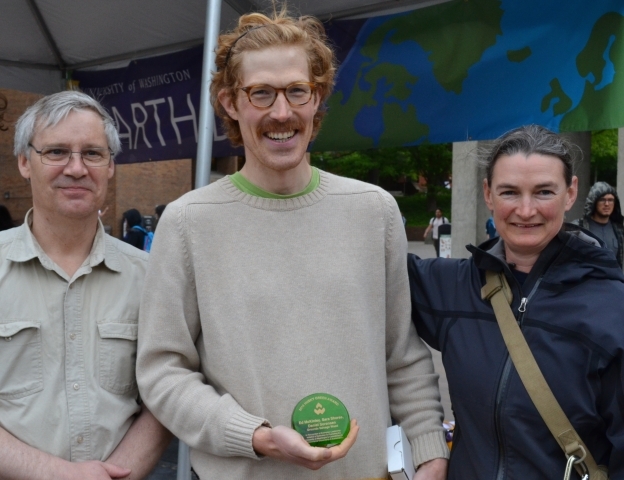 The Husky Green Awards are given annually to students, faculty and staff from the Seattle, Bothell and Tacoma campuses who show environmental leadership and dedication. See all the 2016 Husky Green Award recipients below, or see the full list of the 2016 nominees. Aaron Tam is actively involved with several organizations on campus, including Carbon Washington, Earth Club, and UW Recycling. 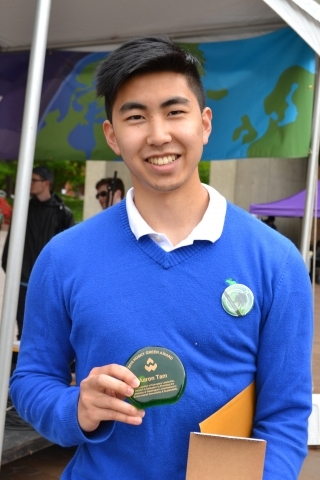 As Earth Club president, he has been involved in plastic water bottle reduction on campus and developed environmental projects on climate action. Tam has also been the student outreach coordinator for the UW Recycling team since 2013. He is actively involved in raising awareness on how to properly recycle and compost on campus and has come up with new and innovative ways to motivate students to maintain the cleanliness at football games and events. He also collaborates with the UW Sustainability Office, campus environmental clubs and UW Recycling to setup large-scale projects, including football bluebag recycling outreach, Dawg Daze, RecycleMania, and Earth Day. As UW campus coordinator for Carbon Washington, Tam has led many community service projects in habitat restoration and petition gathering. 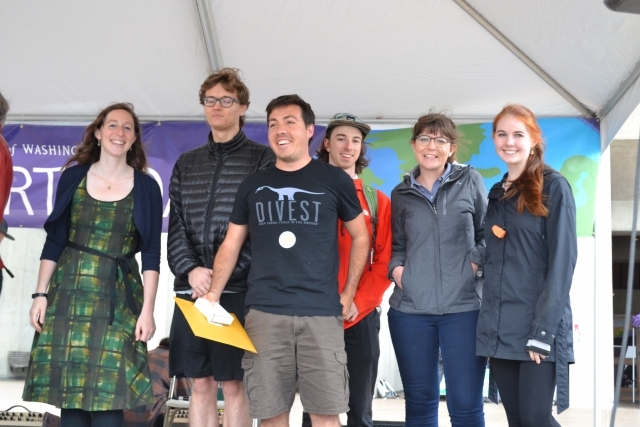 He was also the only UW undergraduate student to collect over $1,400 signatures for the Carbon Washington initiative and was one of three speakers selected out of thousands to deliver a speech on climate action. This past February he also met with legislators in Olympia to discuss 732 Lobby Day, a pivotal moment for potentially reducing fossil fuels in the state of Washington. Read more about Aaron Tam on the In Our Nature blog. UW fans know Melanie Wade for her contributions to the Husky volleyball team, including All-Pac-12 Honorable Mention nods her junior and senior year. Off the court, she's worked throughout her career to implement sustainability initiatives within the UW athletic department and across the campus as a whole. Wade is the student-athlete representative for the athletic department sustainability committee, and worked for a summer an an intern with Karen Baebler, the chair of the committee, where she was in charge of creating a social media presence on Facebook and Twitter (including creating ECO, the stuffed husky who is the face of the GoGreenHuskies twitter account). She also worked with the athletic department staff to create three short videos that encouraged fans to compost and highlighted the importance of composting and recycling. They were featured in the Alaska Airlines Arena during volleyball season. Wade pushed to get composting in the volleyball team locker, and helped with a research study measuring waste in the HUB to learn more about how people were disposing of food items. Wade is also conducting her own research for her social psychology class to see how different environmental advertisements, pro-environment and anti-environment, affect environmental issues. Read more about Melanie Wade on the In Our Nature blog. Rebeca Rivera is leading the effort to create a campus garden at UW Bothell, providing a a common space for growing sustainable food, independent study, and putting on class demonstrations. To make the garden as best as it can be, Rivera often collaborates with the UW Farm and other community leaders in sustainable agriculture and education. She has been a mentor for students who have been involved with the process of creating the garden, including creating a student organization to maintain the space. 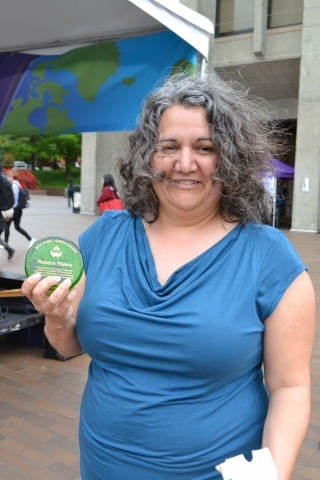 Rivera also dedicates her time in helping students develop leadership skills in sustainability, such as frequently engaging her students in assessments of the waste streams on campus while encouraging waste reduction and composting. Read more about Rebeca Rivera on the In Our Nature blog. 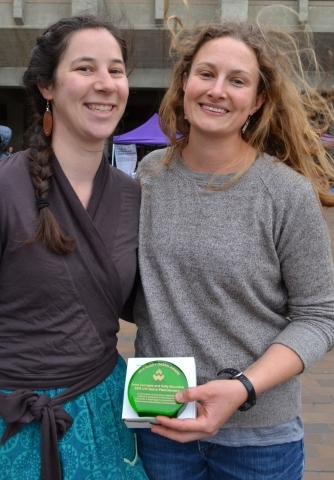 The first two-time Husky Green Award winner, Tali Haller has won the award both as a freshman and a sophomore for her efforts in promoting sustainability in the UW Greek community and beyond. As a freshman, Haller worked on a pilot project to track light usage in the sorority house to serve as the "case study" to show the potential for waste and energy efficiency in Sigma Kappa buildings nationwide. She has continued to work on sustainability efforts in her own house, and has also helped launch the Green Greek representative program through EcoReps, which works with representatives from all Greek houses on campus to implement sustainable practices. She has also participated in the Environmental Alternative Spring Break and has worked as field manager at Seattle’s Fund for the People’s Interest. 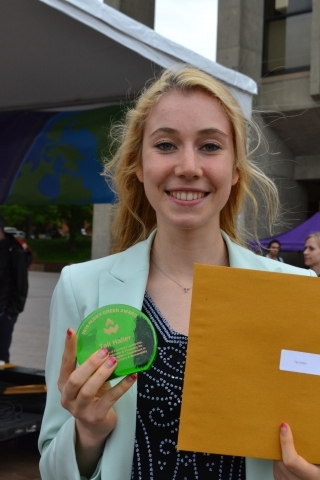 She hopes to have a career where she can create environmental change at the international level. Read more about Tali Haller on the In Our Nature blog. In the spring of 2015, the student group Confronting Climate Change - also known as Divest UW - celebrated a victory when the University of Washington's Board of Regents voted to divest from coal companies. The move was one that the group had fought for. In 2012, Divest UW delivered a petition to then-UW president Michael Young requesting fossil fuel divestment. Afterward, the students continued to press the UW administration, leading to the divestment vote. Confronting Climate Change isn't content with stopping there. Alex Lenferna, one of the key leaders in Confronting Climate Change, has done a lot of work to put a price on carbon pollution in Washington state. Lenferna, including other team members from the group, helped develop I-732, an initiative that will promote cleaner energy and make polluting more expensive. This initiative will be in the November 2016 ballot. Read more about Confronting Climate Change on the In Our Nature blog. The Society for Ecological Restoration's UW Chapter has been working to restore native plants to areas around campus, with the help of their native plant nursery. The nursery allows SER-UW to restore areas on campus by increasing native species biodiversity and creating open spaces for students to engage with the natural world just steps from their residence halls. The plant nursery is on the grounds of the Center for Urban Horticulture on the northeastern edge of campus. Graduate student co-managers Anna Carragee and Kelly Broadlick have worked to establish and expand the nursery, including getting a Campus Sustainablity Fund (CSF) grant to build a new hoop house to expand the nursery's capacity. Read more on the In Our Nature blog. The Salvage Wood Program at the University of Washington is working to make sure any trees which need to be removed on campus can have a second life. The program, run by Grounds Management and made possible by a Campus Sustainability Fund grant and help from the UW chapter of Engineers Without Borders, turns those removed trees into lumber for projects on campus such as benches and tables. This keeps the wood out of the waste stream while providing a greater connection to the natural environment of campus. Read more on the Facilities Services blog. In recognition of each award recipient, 10 native plants are planted in their honor. We would like to thank the UW Botanical Gardens and the UW Environmental Stewardship Committee (ESC) for making this possible.